Running out of gadget battery power when you’re away from a charger is a maddening, but common, scenario. Designer Ping-Yi Lin came up with an intriguing concept to keep all of our stuff powered up no matter how often your batteries quit while you’re away from home. 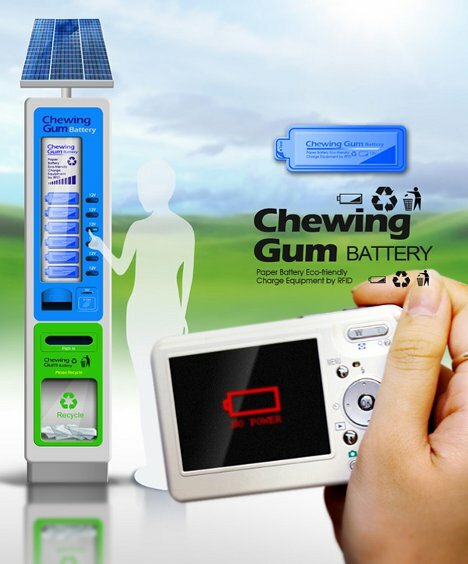 The Chewing Gum Battery concept involves paper-based batteries that are kept in a public outdoor dispenser attached to a solar charger. 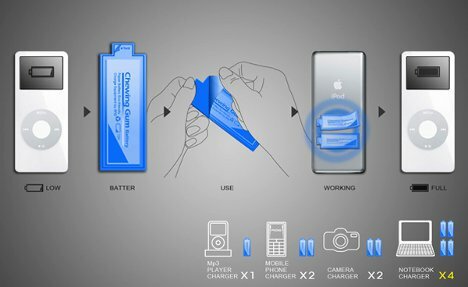 When someone needs a quick boost of battery power, they buy a pack of the fully-charged batteries, peel off the protective backing, and stick the sticky backs of the batteries to the device that needs charging. Different devices will need different quantities of the little batteries. Each battery transmits its power to the device via RFID, although exactly how this would work is not discussed in the designer’s information. When the batteries are drained, users can recycle them at any Chewing Gum Battery dispenser.